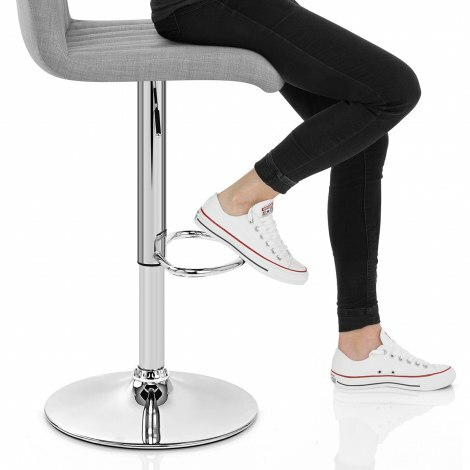 Fall in love with the simple look of the Debut Bar Stool Grey, the perfect combination of style and substance. The ideal choice for those seeking to upgrade their bar area with comfortable and contemporary appeal, the Debut is set to be a success. Upholstered in stylish grey fabric, its contemporary look is bang on trend, enhanced by the addition of vertical stitched detailing. Not compromising on comfort, the tall backrest and seat pad boast generous amounts of high-density foam padding, cushioning the body as you relax. The sturdy central column is plated with high-shine polished chrome, reflecting its surroundings and effectively brightening up any location. It incorporates a gas-lift mechanism for adjustable height, as well as the ability to rotate 360-degrees, and a curved footrest. Lastly, a rubber floor guard under the base helps to prevent scuffs and scrapes to your floors, making the Debut as practical as it is fashionable. 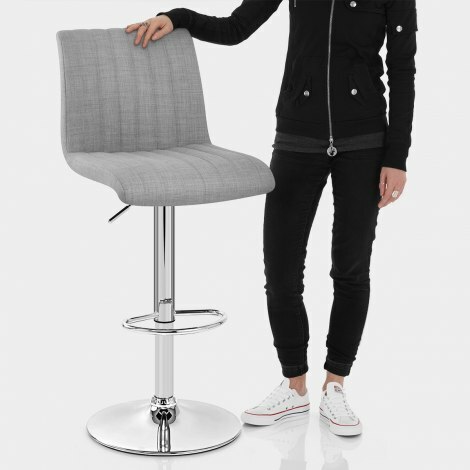 "Very very comfortable and look incredibly stylish"
Love my bar stools. Very comfy and they do not feel like you could fall off them like some do. Had a few guests commenting on how stylish and comfy they are. Would definitely recommend. We bought 3 of these to go in our new kitchen. They were a very good price, arrived quickly, very easy to assemble, and they are really well made. Five star review from us! Love our grey bar stools. Look amazing, very comfortable, excellent value. These are great, I didn't want faux leather, wood or hard backed. These fit the bill perfectly, look great, comfy to sit on and are really easy to put up, they took 5 mins per chair. Lovely bar stools. Just what i wanted. Ordered, delivered and assembled in less than 24 hours! Thats service!!! Would recommend product and company.